There's a modern-day Amelia Earhart flying around out there, and her name is…Amelia Earhart? Amelia Rose Earhart is a news anchor, philanthropist, and a pilot. zdue to her name, she's lived her entire life in the shadow of the infamous Amelia Earhart, who attempted to circumnavigate the globe in 1937 but vanished at sea. Who is this contemporary Amelia Earhart? Is Amelia Earhart her real name, and is she really a pilot? Amelia Rose Earhart is not a blood relative of the late Amelia Earhart, but Amelia Earhart is her real name and she is, in fact, a pilot. And beyond her name, today's Amelia Earhart has a few additional things in common with the legendary Earhart, including an adventurous spirit, a passion for flight and the accomplishment of flying around the world. In the summer of 2014, Amelia Rose Earhart flew around the world in a Pilatus PC-12 NG. Dubbed "The Amelia Project", the flight was meant to commemorate the infamous flight that Amelia Earhart attempted in 1937 and raise awareness for the Fly With Amelia Foundation, a nonprofit organization founded by Earhart that offers scholarship opportunities and STEM-based education programs. Amelia's 2014 flight departed from and returned to Oakland, California. It lasted 17 days and included 14 stops, ten of which are original locations from Amelia Earhart's first flight attempt in 1937. Along with her copilot, Amelia confronted weather, turbulence and a seemingly endless ocean for more than 100 hours during the flight around the world. The 2014 Pilatus PC-12 NG that the modern Amelia used is a single-engine turbine propeller aircraft with a range of about 1,500 nautical miles - a much more advanced aircraft than the original Lockheed 10 Electra that was used in Amelia Earhart's 1937 attempt to fly around the globe. The aircraft is equipped with state-of-the-art Honeywell Primus Apex avionics, including two Multi-Function Displays (MFDs) and two Primary Flight Displays (PFDs), an engine monitoring system and the latest Communication Navigation Surveillance/Air Traffic Management (CNS/ATM) capabilities. Ground support, including flight planning, navigation, weather, and operations management was provided by Jeppesen. It's no surprise that a flight of this nature would utilize multiple forms of technology, and Amelia's flight around the world was the first flight to include a live-stream from various cameras inside the cockpit so that people could track the flight from anywhere. As a sponsor, Honeywell tracked the flight and displayed it from its Global Data Center online, allowing people to follow along and experience the nature of flying and how it all works. Social media also played a big role in Amelia's flight, as well, with Amelia posting live Facebook and Twitter updates from the airplane's onboard Satcom connection. "We want to expose people around the world to aviation, and social media will help with that," said Earhart. "Flying is an adventure each and every time, and we want people to engage and get involved." 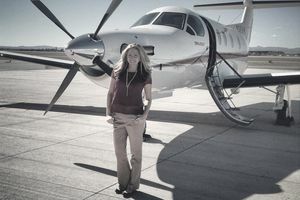 In addition, Earhart will be working to raise awareness and funds for the Fly With Amelia Foundation, a program with intentions of introducing aviation to young people in Colorado and elsewhere. Which Type of Aviation Medical Certificate Should You Get?